Lackluster sound reproduction, garish design, and an iffy mic make this headset a poor choice. Handy extension cable; four-pole adapter; retractable mic. This article was published in the December 2015 issue of Maximum PC. For more trusted reviews and feature stories, subscribe here. Razer hasn’t done as well as it maybe should have in our reviews lately. As far as peripheral manufacturers go, it’s certainly put plenty of time and effort into research and development -- so you'd think it should probably be winning the hearts, minds and wallets of us all. However as far as the Kraken Pro is concerned, that’s simply isn't the case. Not the way the cookie crumbles, no sir. Headsets have come a long way over the last decade. And even though this variant of Razer’s prestigious Kraken series is priced competitively, at around $80, it just doesn’t hold its own when compared to solutions from other competitors such as QPad, Steelseries or Asus. The reason for this judgement? It suffers from “gamer’s syndrome.” Simply put, it offers up too much bass. For some reason, many peripheral manufacturers have a tendency to lean too heavily on the bass production side with their headsets. And although this is great if you’re looking to have dubstep playing at maximum volume constantly, it just doesn’t cut it if you’re looking for high-quality audio fidelity. This may be news to Razer, but a well-rounded headset consists of mastering not only the lows, but also the mids and the highs. The treble and the mids are just as important as the bass. Even in gaming, you need to hear the crunch of the explosions, the crack of gunshots, the clash of swords, not just the dull thud of the bomb going off as it reverberates around your eardrums, slowly caressing them into oblivion. If you’re looking to get a set of headphones for well-rounded sound reproduction, then these shouldn't make the cut. Unless, of course, bass-heavy noise is your thing. In which case, don't let us get in the way. It isn't all doom and gloom for Razer. The headset is a lovely fit. There’s just enough tension, meaning that even after long periods of listening to music or gaming, it’s still exceedingly comfortable. The earcups are a little small, though they do surround your ears well-enough. Razer also provides an extension cable to ensure you have plenty of room to maneuver. The headset looks pretty stylish, too. 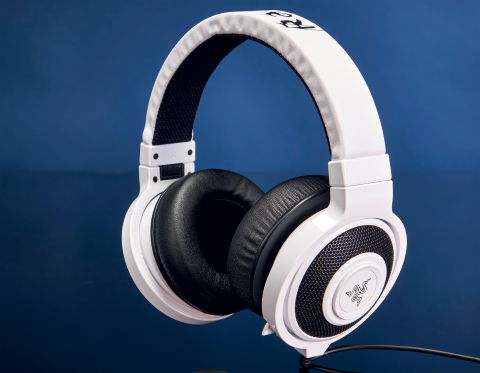 The white finish for this particular special edition version makes it a solid-looking headset. Although, we have to add that you still wouldn’t want to wear these things in public. Even with the retractable microphone, the unsubtle Razer typeface littered across the top of the headband makes you feel like a bit of a donkey—not a design choice we’re fans of here. The retractable mic is a fantastic inclusion, and has extensive noise-cancelling features, so much so that in some cases we couldn’t actually get it to register any sound at all. You might need to tweak it to actually get it to pick up your own voice, but all in all, it’s quite the challenge just to register any noise on the poor thing, even in a busy office environment—maybe that's the problem. Razer has assured us that this is a problem with our review sample, but until we try a different unit, we can only report our experiences here. Ultimately, these headphones just don’t provide a compelling offer to anyone who’s looking at Razer for more than brand worship. The sound reproduction isn't great, the microphone is flaky, and, if you have ears even slightly more than average-sized, you’re going to struggle to fit them comfortably around your lugs. The extension-capable, retractable mic, and four-pole adapter for mobile usage are nice additions, but they’re just not enough to redeem its prior sins. When there are far better, cheaper alternatives available—such as the Kingston HyperX Cloud Gaming or QPad’s QH-85, we’re genuinely confused to see how we could recommend the Razer cans over the alternatives.